As diabetic patients age or the duration of diabetes increases, they may develop diminished sensation and decreased peripheral circulation in the feet and thus are at an increased risk of developing foot infections, especially in those will poorly regulated diabetes. 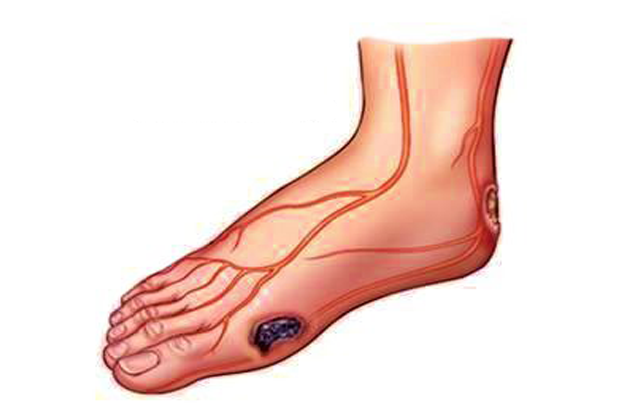 The ischaemic leg, besides absent or reduced pulses, also has other characteristic features.The skin may become thin and there is usually loss of hair on the foot and ankle. Fissures are very common and ulcers may be painful. It may also be cold to touch. The neuropathic foot also has some characteristic features. The feet tend to be warm and dry and relatively insensitive to touch. Neuropathy may affect the muscles of the foot causing clawing of the foot. All this causes the fat pads covering the bones of the feet to be moved away from its position. Thus exposing it to weight bearing areas. Any weight bearing area without adequate protection tends to open and form a wound called as an ulcer. In order to protect the leg, nature offers a mechanism by which it thickens the skin to avoid forming a wound. This protective mechanism will lead to problems such as callus and corns in later stages due to irritation of the tissues beneath. These can break down and lead to ulcers. Both Ischaemic and neuropathic lesions are commonly complicated by infection. Common symptoms of infection are fever, redness, swelling or pain. Pus may also be seen in the lesions. It is common for a patient to have all the processes mentioned above occurring at the same time. Thus a person can have an infected, neuropathic lesion with poor blood circulation. To identify and treat the common problems of diabetic foot every individual with diabetes should know what are the abnormalities to look for in their feet. Early detection and prompt attention can not only help save feet, they can also be life-saving. 1. Keep feet clean - wash them regularly. 2. Use only lukewarm water - no hot water, heating pads, hot water bottles, iodine or alcohol. 3. Keep the feet dry - especially between toes-use unscented lotion or cream to keep skin soft. 4. Use only medicines recommended by your doctor or chiropodist (podiatrist). 5. Cut toe nails straight across, not deep into the corners to help avoid ingrown toe nails. 6. Never use razors, knives or corn caps to remove corns. 7. Wear shoes or slippers at all times -never walk bare foot even at home. 8. Wear good fitting shoes/slippers - not tight or wornout ones. Boots should be used only for short periods. How to self examine your feet? 2. Hold a big size mirror beneath your feet 6 - 12 inches away. 6. Localised redness or warmth of the feet. 6. Any shiny appearance on the feet. Inform your doctor if any of the above are present!